A Word Cloud is an image composed of words used in a particular text or subject, in which the size of each word indicates its frequency or importance. 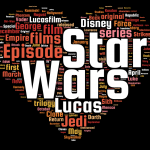 By using the Wikipedia entry for some well known franchises the following Word Clouds were produced. 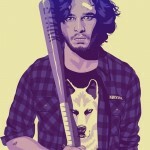 French artist and graphic designer Mike Wrobel has given some of favorite and not so favorite Game of Thrones characters a 80s and 90s style makeover. It is amazing how well he captures the personalities of the characters bore out only in common style of the two decades. The Stark children are especially well done.